A dreadful disease called acute glanders has been discovered in a horse and veterinarian R.J. Ramage ordered that the animal be destroyed immediately. In addition to rapidly causing death, acute glanders can be spread from horses to humans and there is no known cure, at least in 1907. Apparently several men in Los Angeles County died of acute glanders in 1893. Since glanders is often found in horsesâ€™ nasal passages, local veterinarians want to ban wooden water troughs from city streets, saying that they are a breeding ground for the disease. In 1911, Pasadena authorities ordered that 14 horses owned by the Pasadena Ice Co. be shot to death because they had the disease. The county veterinarian also quarantined a stable occupied by a dozen horses and â€œa number of Chineseâ€ after detecting acute glanders. â€œThe disease is so infectious that it can be contracted by a horse sneezing in oneâ€™s eye,â€ said county Veterinarian W.B. Rowland. 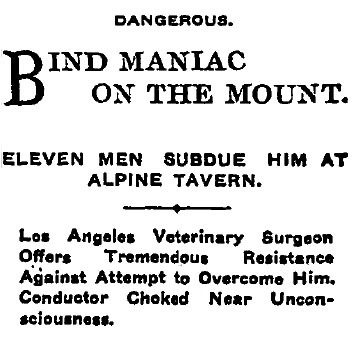 In 1909, Ramage, of 831 S. Los Angeles St., went on a violent rampage at the Alpine Tavern on Mt. Lowe and it took 11 men to get him under control. â€œAt the tavern, the man created notice by talking continually to himself and created a disturbance by falling on his knees in the ashes of the fireplace; bowing his head down almost to the embers and offering violent words of prayer,â€ The Times says. After being taken to Pasadena, Ramage was put in a car for the ride to the county hospital. â€œAll the way to Los Angeles, the unfortunate man screamed and struggled, endeavoring to throw himself from the swiftly moving machine,â€ The Times says.